The Thai government says Koh Tachai, an island off the southern coast of Thailand known for its beautiful coral reefs and coral reefs, will close indefinitely. 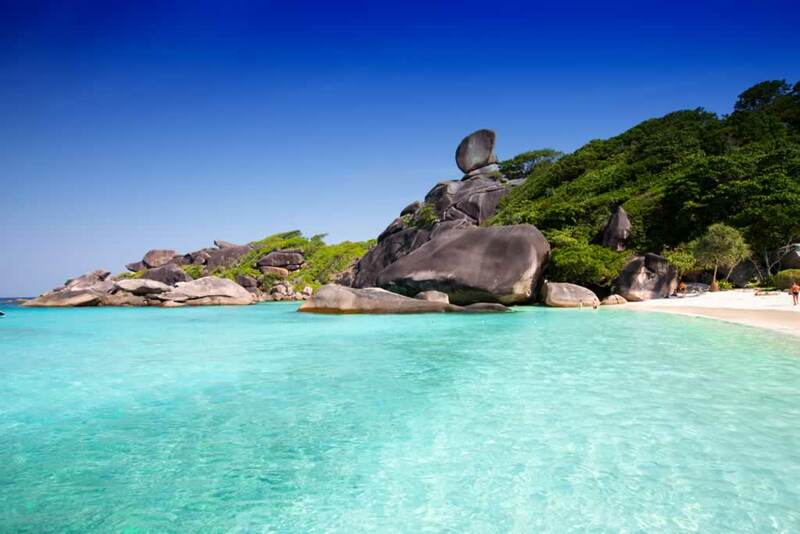 The Department of Wildlife and Plant Conservation and the National Park of Thailand announced that the beautiful Similan Islands in the Adaman Sea will not receive tourists from May 15th to 15th, so that natural resources have time to rest. foul. Koh Tachai was voted the most beautiful island in Thailand. The island is paradise with blue sea, crystal white sand, located in the Andaman Sea, 7.4 km2. According to Tunya Netithammakul, General Manager of the National Park and Nature Conservation Authority of Thailand, thanks to its natural beauty, Koh Tachai has become a popular tourist destination with domestic and foreign tourists. This has led to overcrowding and severe degradation of natural resources and the environment. Dive areas are gradually being contaminated by overload of tourists. In addition, many groups lack the knowledge of the marine environment and cause panic for fish. In fact, Koh Tachai is a primary conservation area, not a tourist destination. Each beach is enough for 70 visitors but the number of people here is always overwhelmed when up to more than 1,000 people. In 2015, Thailand's Ministry of Natural Resources and Environment warned that Koh Tachai was threatened by waste, garbage and environmental pollution caused by overcrowding. At that time, the authorities ordered the closure of bars and limited visitors to the island. Koh Tachai is just one of the islands that Thailand has closed to minimize the impact of travel to this place. Prior to this, Thai officials also did the same thing with the Similan Islands, Mu Surin, Koh Khai Nok, Koh Khai Nui and Koh Khai Nai. The next measures are the closure of beaches, dive spots and some changes to cruise lines. Koh Phi Phi, an island in southern Thailand, 1.5 hours from Krabi City, may be the next stop. It can be seen, the Thai government is determined to resist the adverse effects of tourism on natural resources and the environment. Tourism is Thailand's spearhead industry as it brings significant economic benefits but also causes many attractions to be damaged as tourist flows become overcrowded and out of control. . So the fact that the Thai government decided to close many well-known tourist resorts is a clear message about choosing to protect natural resources against the effects of development and not sacrificing the environment. Just because of the immediate resources. In particular, Koh Tachai island in the archipelago will be closed indefinitely due to heavy damage from tourists. About 1,000 visitors to Koh Tachai every day, even though the maximum occupancy here can accommodate just 70 people, poses a serious threat to the environment and the natural treasures. "Thanks to its beauty, Koh Tachai has become a popular tourist destination for both Thailand and foreigners. This has led to overcrowding and degradation of natural resources and the environment, "said Thanya Netithammakun, director of the Bureau of Conservation of Flora and Fauna and National Parks in the Bangkok Post. Mr Thanya said: "We have informed the tour operators of the closure of Koh Tachai three months ago. However, there are currently 14 units continuing to sell tours to this island. " Any unit that violates the restraining order will have to go to court, and be deprived of the license. Mr Thanya warns travelers not to cheat on companies promising to travel to the islands during tourist halt. Thailand is now one of Asia's tourist paradise, as each year the country attracts millions of visitors to the resort. Especially sea island tour, from Pattaya to Phuket. Recently, however, the Thai government has announced the closure of the waters and coral reefs surrounding Koh Tachai in Similan National Park, off Phangnga province, due to possible tourism concerns. Affect the island. According to the announcement, the closure decision will take effect from 15 October and be limited to all visitors. The decision comes as a new rule for tourism in Koh Tachai after the Ministry of Natural Resources and Environment announced that it was threatened by dead corals and garbage left by large numbers of visitors. Accordingly, tour operators will not be allowed to use large explosion-proof boats and to bring their trash back to the mainland. Activities such as swimming and diving are also prohibited in some areas. Guests are not allowed to take coral, go to the beach, or do anything that affects the marine resources. Tunya Netithammakul, director of national park and botanical conservation, said tourism activities in recent years have severely affected the region. Therefore, the closure aims to minimize the negative impact of tourism on the natural and environmental resources of Similan National Park and the Biosphere Reserve. "We have to close down our efforts to restore the environment both in the island and in the sea, which will help Koh Tachai not be affected by tourism activities before environmental damage is impaired." There is no cure, "Tunya said. Koh Tachai Island Declaration was declared three months ago. All marine reserves will be closed Monday through October 15 during the rainy season in Thailand. However, after October 15, Koh Tachai Island in Similan National Park will be closed permanently. Thon Thamrongnawasawat, head of fisheries at Kassetsart University, found that 14 travel companies were still selling packages to Koh Tachai when he was invited to a Thai tourism fair on Sunday. Therefore, visitors should consider and carefully consider the travel companies still listed tour operators visiting the island after October 15. Professor Thon warned.